Choose to grow and sell plants that make the garden truly alive. No one writes poems and verses about landscapes. It’s a “garden” that incites poetry and dreams; where we want to hang out, muse, or just relax. What separates the use of the term garden from landscape? What’s the difference between hiring a landscape firm, a landscape architect, or a gardener if you wanted someone to design and plant your backyard? What differentiates a garden from a landscape? Do you want a gardener taking care of your plants or a landscaper? There should be a lot of questions asked. Visualize a garden. Maybe a yard you have visited. A nice little lawn shaded by some beautiful mature trees. A wonderful variety of shrubs faced by lots of flowering perennials. Some comfortable chairs to take a seat and it smells pretty good. You may notice the sounds of birds before you see them. Observe for a while and you recognize the butterflies bouncing by and the hear the buzz of some pollinators. It’s a cool way to spend some time. Now consider a landscape. A couple of trees placed equidistant from the corners of the property. A few, mainly evergreen shrubs, placed around the foundation of the house or commercial property, probably chosen because they are “carefree” and cheap. And finally, lots of turf to be mowed, blown, and fertilized. 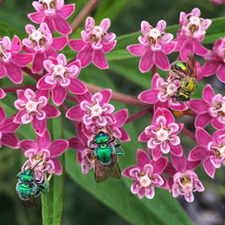 What do native plants have to do with gardens versus a landscape? It all depends on whether you’d like a garden alive with butterflies, pollinators, birds, and wildlife or a landscape that has a lot less. Let’s do some quick Google searches and compare the plant lists. Try “landscape plants,” “garden plants,” “plants for butterflies,” and “plants for birds.” This is an easy one to do yourself. First up is a search for landscape plants. The first pages that pop up, top of the fold so to speak, are fairly generic. Plus, they are not regionally selective in many of the suggestions. Many are attractive landscape plants, peony, loropetalum, cotoneaster, daylilies, evergreen hollies, liriope, and some exotic grasses. But some of these plants may be alarming — barberry, Japanese spiraea, Miscanthus, and butterfly bush can be highly invasive, and perhaps illegal, in many areas of the U.S. Do you really think the average consumer will find the ones that have been bred to be sterile? And we all know that nandina berries are poisonous to birds. All these plants are very familiar to us. I saw them all recently at the trade shows, perhaps in your booth. They are extremely common in landscapes, but plants that are not reasoned to be ecological friendly. Do your own search and see what you find. The search for “plants for butterflies,” “plants for pollinators,” or “plants for birds” brings up a completely different set of pages and plant lists. Many are regionally specific, listing the type of wildlife they attract, and diverse in suggestions. They also contain plants that are readily available, such as echinacea, lobelia, rudbeckia, Ilex, Physocarpus, Cercis, and Cornus. Most of these plants are very familiar to us, too. I bet you saw them at the trade shows, maybe in your booth. And these plants will certainly bring the wildlife to your yard. These are the plants that create a garden that truly makes it alive. If you haven’t been paying attention to what our scientific community has been saying about the immense decline in birds, bees, and butterflies happening around us, do a search on that. You certainly are aware of the decline in monarch butterfly populations. The horticulture industry can choose to play a decisive part in this battle, although it hasn’t up to this point. Think of the free marketing and public relations, not to mention sales, that could be made if we joined together as an industry. Joining in on saving the pollinators, birds, butterflies and so on. Can you imagine all the consumers (think millennials and gen X) out there that would buy more of these plants to help? I know it’s completely different than the constant focus on patents and branding, but the payback may be the future. Saving the earth, one plant at a time.